Perfect for general use and specifically designed for daily foot care exams for people with diabetes. Examine all hard-to-see areas without twisting. 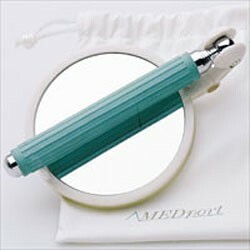 Two-sided shatter-resistant mirror -- regular and 2X magnification. Handle expands from 6 inches to 18 inches. Folds down to fit in protective storage pouch. Soft-grip handle prevents slipping.